Parent PLUS loans, which are “both remarkably easy to get and nearly impossible to get out from under“, can be a trap for uninformed borrowers. Remember no-doc mortgage loans? Parent PLUS loans, federally sponsored and available for parents of college students, are eerily similar. The loans are both remarkably easy to get and nearly impossible to get out from under for families who’ve overreached. When a parent applies for a PLUS loan, the government checks credit history, but it doesn’t assess whether the borrower has the ability to repay the loan. It doesn’t check income. It doesn’t check employment status. It doesn’t check how much other debt—like a mortgage or other student loans—the borrower is already on the hook for. Designed for families who may not qualify for other types of debt, PLUS loans “sometimes hurt the very families they are intended to help”. Of course, Parent PLUS can be an important financial lifeline—especially for those who can’t qualify for loans in the private market. An iffy credit score, high debt-to-income ratio, or lack of a credit history won’t necessarily disqualify anyone for a PLUS loan. Applicants are approved so long as they don’t have an “adverse credit history,” such as a recent foreclosure, defaulted loan, or bankruptcy discharge. Unlike other federal student loans, PLUS loans don’t have a cap on borrowing. Parents can take out as much as they need to cover the gap between other financial aid and the full cost of attendance. Colleges, eager to raise enrollment and help families find financing, often steer parents toward the loans, recommending that they take out thousands of dollars with no consideration as to whether they can afford it. When it comes to paying the money back, the government takes a hard line. PLUS loans, like all student loans, are all-but-impossible to discharge in bankruptcy. If a borrower is in default, the government can seize tax refunds and garnish wages or Social Security. What is more, repayment options are actually more limited for Parent PLUS borrowers compared with other federal loans. Struggling borrowers can put their loans in deferment or forbearance, but except under certain conditions Parent PLUS loans aren’t eligible for either of the two main income-based repayment programs to help borrowers with federal loans get more-affordable monthly payments. Parent PLUS spending has shot up over the last decade. 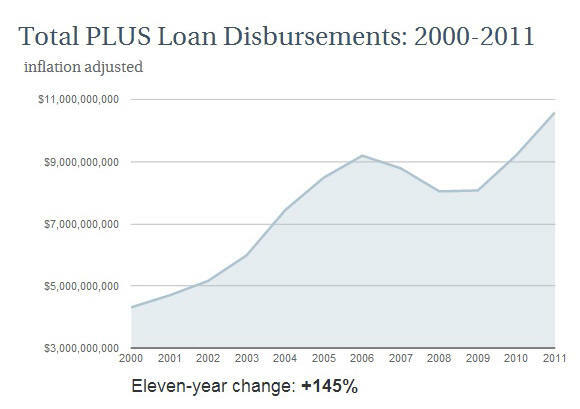 Last year the government disbursed $10.6-billion in Parent PLUS loans to just under a million families. Even adjusted for inflation, that’s $6.3-billion more than it disbursed back in 2000, and to nearly twice as many borrowers. An interactive list of schools with accompanying Parent PLUS data shows that many of the institutions with the highest average loans are art and music colleges. New York University is ranked 11th, with an average loan balance of $27,305. Except that financial aid directors over the past three decades have found increasingly-self-focused parents less and less likely to borrow for their children’s educations. Anything that makes it easier for them to sign is a benefit. Lenders in the guaranteed student loan program had a more subtle excuse — the quarterly taxpayer subsidy calculation for PLUS was less favorable to them than Stafford and consolidation. With the lenders out of the origination picture since 2010, it would be natural for colleges to revisit their FUD-based opposition to PLUS lending. I don’t understand how colleges have found parents increasingly less likely to borrow yet PLUS loan disbursements and number of recipients have grown so much. They have grown but slower than student loans as a whole, i.e., when including Stafford loans and Grad PLUS loans. Parent PLUS originations have actually declined from 13% of federal student loan originations (in dollars) in Award Year 2006-2007 to 10% in AY 2011-2012, although the Parent PLUS share of originations has recovered somewhat from the trough seen in AYs 2008-2009 and 2009-2010 — 9% of federal student loan originations.